Bumble Bee style is filled with delightfully buzzy, bright dancing flowers and a bee or two humming around them. There is even a place to add a photo on some shapes. This is a wonderful design for a fun outdoor or summer party for your little one or for anyone who loves bees and sunshine. Enjoy bright summery outdoors and all the flowers that go with it, with Bumble Bee style. Customize your Bumble Bee labels today! Printed on your choice of coated paper or waterproof vinyl label stock, Evermine labels are peel-and-stick and come on sheets measuring 9" x 12". Depending on the size of the labels, there are between 6 and 60 labels on each sheet. All Evermine label stocks print with fine detail and rich color. They are writeable with a sharpie or marker. The vinyl labels will do just fine immersed in an ice bath or a refrigerator. The vinyl labels are also easy to reposition or remove from smooth surfaces such as glass, metal and plastic. 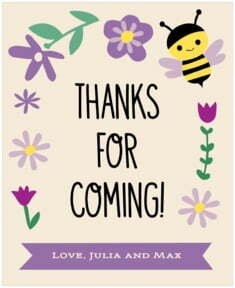 Make all your special events and products memorable with Evermine personalized Bumble Bee style labels. These labels are not guaranteed to withstand a trip through the dishwasher, or prolonged use around creams, oils or acids such as citrus oil, vinegar, fragrances, etc.